From this recipe, we would say the potatoes were the best part. They were easy to make and delicious. We will save the potato recipe to quickly make steak fries for burgers next time. The chicken itself was just ok. 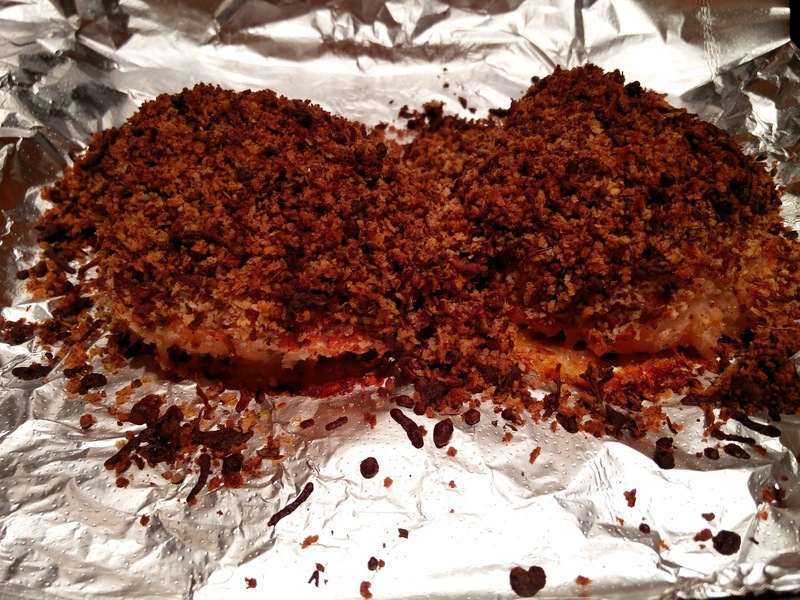 It seems like that with the panko breading, the chicken would have been better off fried. The tomatoes were just sad. They were just squishy and weird. It was sort of like eating tomato sauce. Also, we did more than the three potatoes that came with the box, we love potatoes! 1. Preheat the oven to 400 degrees. Cut the potatoes into ½-inch wedges. Core and quarter the tomatoes. Mince the garlic. 2. 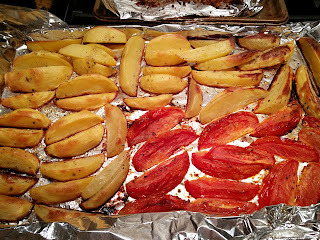 Toss the potatoes on one side of a foil-lined baking sheet with a drizzle of olive oil and a pinch of salt and pepper. 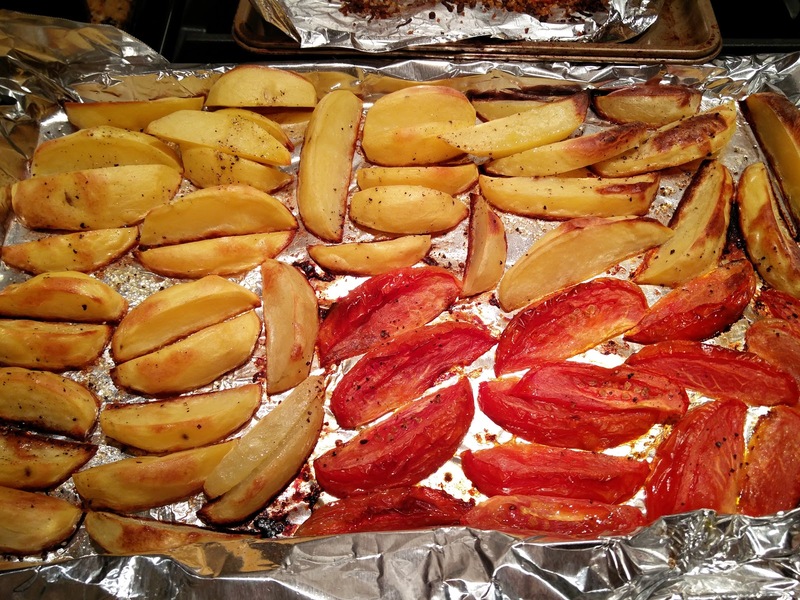 On the other side of the baking sheet, toss the tomatoes with a drizzle of olive oil, the garlic, and a pinch of salt and pepper. Place in the oven for 25-30 minutes, tossing halfway through, until the potatoes are crispy and the tomatoes have shriveled. 3. In a medium bowl, combine the panko, oregano, paprika, mozzarella, a drizzle of olive oil, and a pinch of salt and pepper. Place the chicken breasts onto another lightly oiled baking sheet. Season the chicken breasts on all sides with salt and pepper, then rub with a drizzle of olive oil. 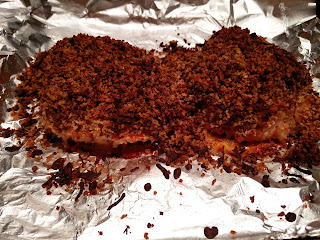 Press the panko mixture onto the top of each chicken breast, firmly pressing with your palm to adhere. Pile the topping as high as possible, however you may have some leftover. 4. Place the chicken in the oven for 15-20 minutes, until cooked through and the topping is golden brown. 5. Thinly slice the basil leaves. 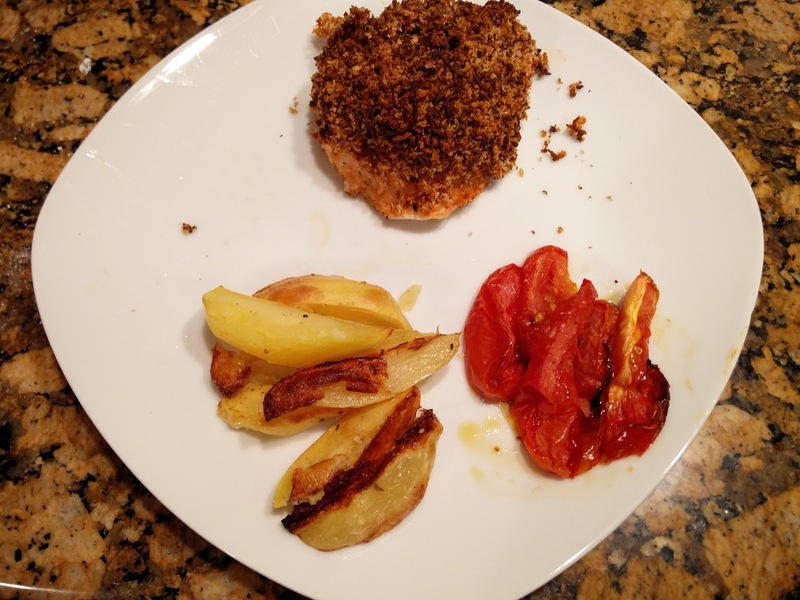 Serve the mozzarella-crusted chicken with the potato wedges and garlic-roasted tomatoes alongside. Sprinkle with basil and enjoy! The tomatoes were not very good. Again, he did not find this meal appealing. Astrid loved the potatoes. Keep the potato wedge recipe only.